You may know me from featuring on Lindsey’s blog before. In particular, you may have seen a guest post I wrote 12 months ago about my son, Samuel, who was born still at 38 weeks. I was recently contacted by an angel mummy who is sadly new to this awful collective of broken-hearted people, so I began seeking out and re-reading some of the posts, poems and diaries that I had written when I was in the early grip of grief. And I read that post from Samuel’s first birthday. It took me by surprise just how raw it was, excuse the surname pun. When I read it back I really felt the twists of pain right from the first sentence and it shocked me. It wasn’t necessarily the feelings I was experiencing coming up to my child’s first birthday in heaven, but that I was so open and honest about the agony I was experiencing, and continue to do so. I feel I’m a lot more private about my feelings just a year on. I don’t want to alienate myself even more than I have been by being ‘the one with the dead baby’ as to being the one who continually goes on about her dead baby. Despite the progress made in the baby-loss community about breaking the taboo, I can still see it pains some people to hear me talk about Samuel. Talking about him is all I can do; I don’t get to see him or hold him or guide him through life’s journey. What did surprise me the most about the post, however, was seeing how much I have achieved in the last year. Despite a few significant wobbles, I can see the progress made in the healing process. I can avoid the triggers that set me off down a dark path, I am more resilient when it comes to certain things and when I do hit a low, it doesn’t quite take me as long to climb out of the black hole. I’m far from “healed”, which is a state where I don’t think I’ll ever be but I don’t necessarily always have that chest-crushing agony with me all the time anymore. I have accepted that I will never really be 100% happy ever again. Even if we are blessed to have 10 more children, I will always grieve for my lost son. Even if we won £100 million on the lottery, I would still feel an element of sadness for the places I couldn’t take Samuel to or the things I could have bought to spoil him with and can’t. I’ve tried a few things to get me to this stage. The yoga phase was great, but short-lived. Extensive counselling has been very effective and hugely beneficial. Internet shopping; successful but expensive! My nail business, which brought me back into the land of the living, was a fantastic distraction and creative outlet, but I no longer need it to stop me from getting stuck in my own head because I am now able to just be on my own, with my own thoughts and be OK. This is something I thought would never have been possible a year ago. My mindful meditation phase is still going strong – again, something I really recommend. I am a lot more social again these days, with lots of exciting things planned. This is huge progress; I remember a time when I couldn’t even leave the house. Another thing that helped me was to partake in some charity work. Not much so far, but it’s a start! 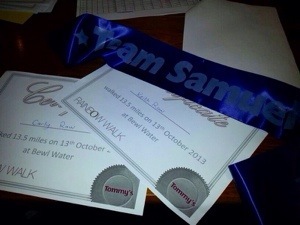 As well as generous family and friends raising tons of money towards a SANDS local memorial garden, we also took part in the Rainbow Walk for Tommy’s last year. This was something so out of my comfort zone that I found the walk both mentally and physically challenging. I felt like I was really doing something for Samuel and gave me a goal to work towards. 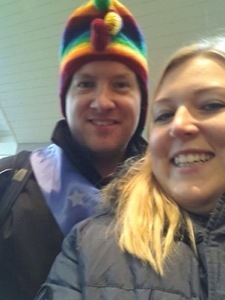 Us at the Rainbow Walk, Keith sporting a rather fetching hat! I’m in the tentative learning stages of knitting as I want to be able to knit blankets to go into memory boxes that SANDS give to hospitals around the UK. I can even read patterns now without a translator! There are so many fab organisations out there doing amazing work to research and support bereaved parents. There’s an organisation called Abigail’s Footsteps which I follow who have made a film about Stillbirth called “The Deafening Silence” and I actually can’t finish it. It captures so horrifically accurate the trauma of stillbirth that it actually rendered me breathless. That moment of hearing the apology and the worst possible words of your life, literally took me back to 13th March 2012 and I couldn’t finish watching. I hope to carry on and be strong enough to watch it one day soon. But if you ever truly want to know what I and so many others have been through, I reckon it’s all pretty much here in the video that can be found on YouTube. I still have an absurd amount of “why me” moments. Those green-eyed monster-y feelings of the fact it should be me bringing home a living child and it isn’t. It never is. I hardly have a Facebook news feed left anymore because of the amount of people I’ve muted. It’s a regular source of torture to see other families looking so happy at the park, zoo, beach, etc., and I just can’t bear to see other people’s smiley, happy memories. I would have course been the same had Samuel lived, I would have proudly showed him off at every given opportunity, it just hurts. It feels like a sharp stab in the heart every time I hear people moaning on FB about their lack of sleep or how their kids are misbehaving when I would give anything to be in their position and not my own. Believe me, it could be a whole lot worse if they weren’t here. Of course, I wouldn’t want anyone else to be suffering like we do, but I just wish we weren’t going through this at all. I want so much to have all these family experiences, but I just don’t know if it will ever happen. The illusive “rainbow baby” – when will he or she make their appearance? If one ever actually does. I still hate this bitter and twisted woman who I’ve become, but I can’t shake her off. I don’t know how to because even if I do get to bring a baby home, is it ever going to really fix my mind-set? So much so for being more private about my feelings, eh?! Happy 2nd birthday to my precious angel Samuel Logan. We miss you every second of every day. We hope heaven is filled with toys for you to play with. When we blow out your candles today, I hope you’ll somehow receive it as a kiss from your mummy and daddy. What was the best piece of advice you received when Sam passed away? Quite a few things spring to mind. The first thing is that a midwife told me that people care so much, but they will stay stupid things. That was definitely true! Baby-loss can be so isolating, and twitter Angel Mummy’s told me to just keep talking, which helped so much because if I hadn’t been so vocal to them, to friends and family, I don’t think I’d be as in good shape as I am. It always helps an angel mummy to talk to them about their child! Lastly, I felt such immense guilt over Samuel dying, felt as though it was all my fault, and I still do to a lesser degree, but being told by two doctors and about 10 midwives that nothing I had done had caused his death, or could have prevented it, did help put some of my feelings to rest. How has losing Sam affected the relationship you have with your husband? In our case, we are more solid as a couple than ever but it can easily go the other way. As I’ve said in my previous post, men and women grieve in such a different way; it can easily lead to misunderstandings and confusion over the others feelings. Marriage is hard blimmin work under the best of circumstances, so losing a child can affect your relationship in an enormous way. For us, we just kept talking, kept checking in on the other, and was considerate to the others feelings if it is was in contradiction to our own. It was so important to me to not lose him as well as everything else, so I make sure that he is my priority. Plus he is the one person above all that I ever want to spend my time with, because he has seen me at my worst, I don’t ever have to explain, he just “gets it”! If you could give yourself a message two years ago, what would you tell yourself? This is quite hard to write, but I would say to myself that this won’t kill you. It may feel like it now, you may wish you were dead too, but you will survive. Samuel is so very loved, still remembered and acknowledged by so many people. His short life has had such an impact on so many people. It is the hardest thing you will ever go through, but you will make it. Thank you for the privilege of reading about your journey. You express yourself and your journey so well with your writing. I imagine that you must be ever so helpful to others who find themselves traveling on your path. 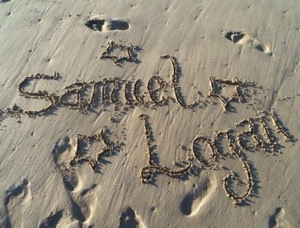 Happy Birthday to your lovely Samuel Logan.